The NYTimes Review of the Original Apple Tablet: "Less Than Fulfilling"
The Newton, like the forthcoming tablet, was introduced with expectations that it would revolutionize personal computing. Apple's then-chairman noted, "It has been said that Apple either walks on water or it sinks." That was after the Newton, well, sank. This vintage NYTimes review, dated September 23, 1993, is remarkable for how forward-thinking it was—except it's clear now, more than 16 years later, that the Newton isn't the ancestor of a tablet as we currently conceive of it. 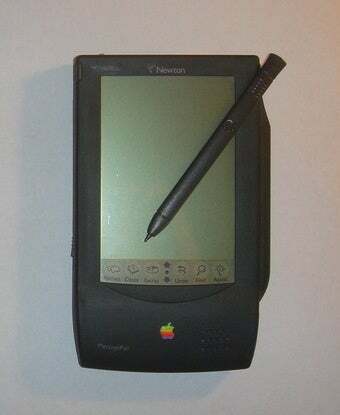 The Newton was the pre-iPhone. The operating system is "communication enabled," which means, in theory, that all data can be faxed, e-mailed, beamed via infrared or sent to a desktop computer or printer. It is also ready for voice, video and other advanced technologies if or when they become available. The possibilities are grand. For example, one can imagine cellular phone circuitry being shrunk to fit in the Message Pad's credit-card-sized PCMCIA slot, or a Newton being shrunk to fit in a cellular phone. "One can imagine" indeed. It only took 14 years for the Newton to be "shrunk into a cellular phone." The one-pound Message Pad, which is about the size of a slim video cassette, is unlike any other Apple computer, and indeed is unlike most personal computers. It has a radically new operating system, a new microprocessor and a new mission: to become the first "anytime, anywhere" pocket computer and communicator for business executives. There are only a few simple software applications available for Newton, including one that makes it easy to split the tab at a restaurant and calculate the tip, among other common executive arithmetic chores. To be fair, this makes the Newton slightly more useful than the Tandy Corporation's rival P.D.A., called Zoomer, which contains a data base of birth stones and state flowers. But the overwhelming message of this review is a measured "wait and see."